Have your chef aprons personalized - WE OFFER EMBROIDERY! A hip NEW collection of Urban Chic Denim Aprons, perfect for a smart casual look. The Chef’s Emporium is happy to offer an entirely comprehensive range of Aprons. This range covers the entire spectrum of styles, colors and textures. 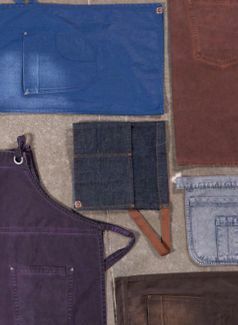 Manufactured, in top quality fabrics with attention to the smallest details these Aprons will serve and exceed the various purposes for which they were designed. Most of the Aprons are crafted in a durable poly-cotton with a soil-release treatment and feature reinforced stress points to keep them looking neat and fresh even after many shifts.Our bib aprons feature adjustable metal neck buckles. In order to make your shopping choices easier we have split up the Aprons based on the following criteria, Black and White, Colored, Striped, and Designer Aprons. In each section you will find all the apron styles available in that selection. 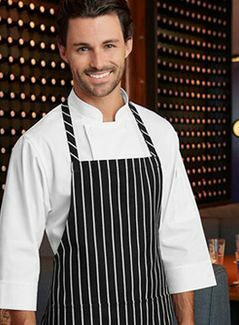 These styles incorporate Chef’s Full Length, Four-way and Waist Aprons as well as, Bistro, Bib, Butcher and Tuxedo Cooking and Serving Aprons. We also feature some brand new and innovative fabrics such as Poly Cotton in both corded and waffle-weave patterns as well as our new denim fabrics. 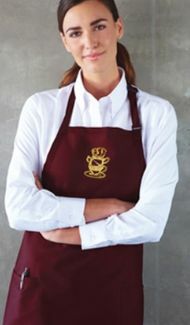 All of our Apron Styles can be Personalized with embroidered names, titles as well as your establishment Logo.